This Rumble ended on 2004-01-01 00:00:00.0. Deep within his frozen wasteland Gellidus slumbered. Visions of death and destruction under a thick lair of merciless blizzards danced in his head. At the edge of his consciousness something nagged at him. It prodded him gently awaking him. The monstrous overlord cracked one eye open. Something was wrong. Another being of incredible power had passed with the boundaries of his territory. He felt its presence and it sent a chill down the dragon’s spine. Something jolly this way comes, he thought to himself. Annoyed at the interruption of his sleep the dragon overlord crept from his lair, stretching his body as he goes. Once he escapes the confines of his cave the overlord stretches his wings and spreads them wide as he launches himself into the air causing a flurry of snow and ice to fall around him. He wings further toward the sky and toward the highest summit overlooking his land. Settling the bulk of his massive body on the precipice he looks around for the intruder. It doesn’t take him long to find a spec on the horizon that grows, only ever more slightly as it approaches. It appeared to be eight flying tiny reindeer pulling a sled though the air. In the chair of the sled sat a man dressed in red. Gellidus thought the color must indicate his allegiance to Malystryx. He decided to wait patiently for the mysterious guest because he did not feel threatened in the slightest. As the strange group flew closer the small white bearded man waved to him in a friendly fashion, the dragon fear not seeming have any affect on him. Gellidus mused he must be related to kender in some fashion even though he appeared to be a portly human. “Ho ho ho” the odd little man laughed. “Hello Gellidus”, he shouted “I understand you have forbidden the celebration of Yule for the people within your realm. Surely this can’t be true. The idea of the fellowship of man and-“ Santa’s speech was cut off in mid sentence as an icy blast of raw power was unleashed upon him. Gellidus, tired of the old man’s rambling, had second thoughts about not harming him and unleashed his frozen breath weapon upon him. Santa and his reindeer were buried under a sheet of sleet, ice and snow and began to drop like a stone from the sky. Feeling satisfied the pest was gone. Gellidus raised his wings to take off. But hesitated as the plummeting snowball, that was Santa, slowed its descent and started to climb again. The snow and ice falling off them like water from a ducks back. Damn, it was obvious he was dealing with a red robed wizard. He would have to be a little more persistent next time. 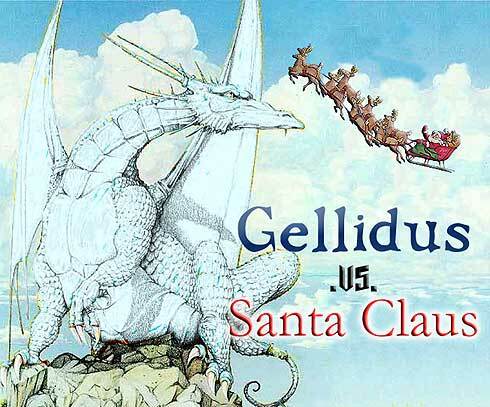 Santa, determined to change the white Overlords mind, set his jaw in a grimace and she called “On Dasher on Dancer on Prancer on Vixen on Comet on Cupid on Donner on Blitzen!” And he raced toward the furious face of Gellidus.